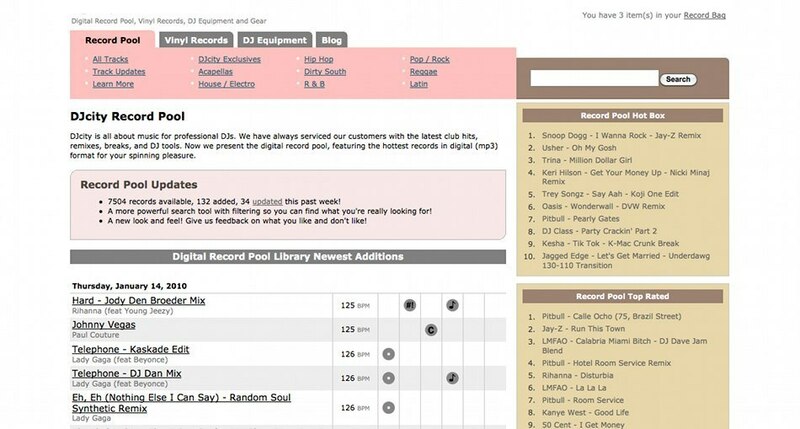 Whether you’re looking for the latest tracks and acapellas or searching for new avenues to expose your own productions, digital record pools are a great dj tool. 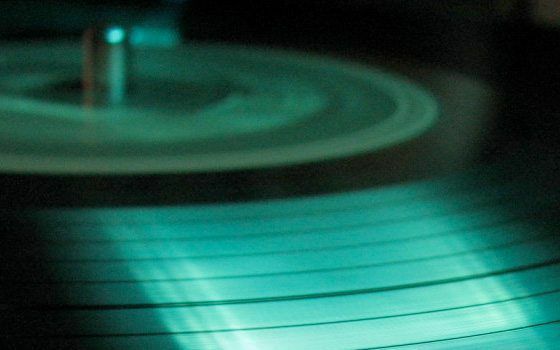 Record pools, now more commonly known as music or dj pools, are symbiotic arrangements between professional djs and record companies. Djs get access to a large pool of new music for minimum or no cost and the record companies get feedback and exposure. This concept has been in effect since the mid 70’s and, more specifically, since disco club pioneer David Mancuso and others created The New York Record Pool. 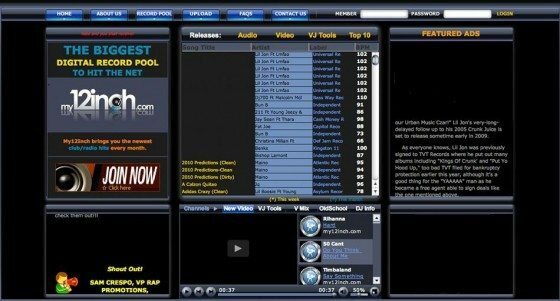 Over the past 5 years, digital music pools have become more popular and with all the new options it can be a bit confusing which ones are worth your time or money. Read on for our thoughts and breakdowns of some the top options available today. The people at IDJpool did away with the frills and get to the straight dope by offering their services through an ftp client. A large selection of top 40 hip hop and RnB are available as well as an extensive dance collection. Price ranges from 30/ mo for hiphop, 30/mo electro or 50/mo for both. This service suits best the DJ who wants to download an entire directory of high quality files over night and review them the next day. Picking and choosing through the collection is hindered by slow download speeds and no previewing. That said, the selection is very good and in particular they have access to some great remixes and edits of old and new pop. 8th wonder has easily the largest and most varied selection of tracks of all the pools we have reviewed. Their hip-hop and dance sections are updated daily and total over 5 thousand which makes the price tag of $10/mo almost unbelievable. The site is well-organized and easily searched. 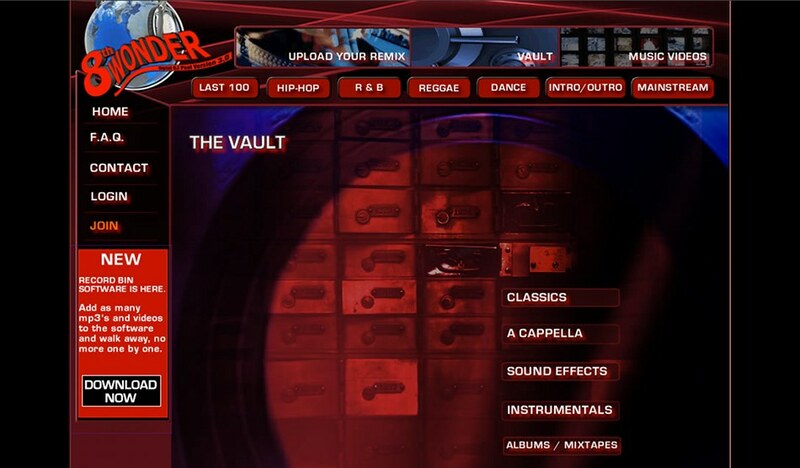 Files from 8th wonder can be previewed and downloaded singly or in a queue, all very fast. This is in part due to the fact that the majority of the collection is stored in 192 kbps (“near CD quality”) as opposed to the standard 320 kbps mp3s. There is also an extensive video section, that like the rest of the site, is relevant and useful. This record pool is a subscription service for $90/3mo for a large top40 and dance collection. The site is easy to navigate through genres but here the search function is lacking. File quality is the highest possible; however, those looking for indie/dance music other than top40 remixes will be left wanting for more. DJcity is one of the few record pools that offer a small latin music selection and also have a store that seems designed for the controllerist in mind. Serato’s promotion arm casts a wide-net and with arguably well rounded selection of tracks. For a free service, the access is to top 40 hits and underground genres is extensive. This, however, is no free lunch. The files have to be played with Serato hardware connected or else your tracks will sound like they are being played out of a tin can. Tracks can be previewed in full quality on the website, but because the files are encoded in a proprietary format, they also cannot be edited or used with at least one harmonic mixing program. 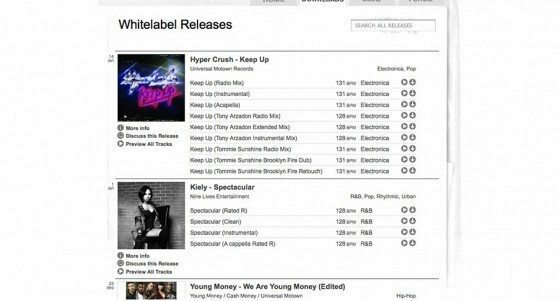 In conclusion, whitelabel is a banquet for the choosy beggar who is enslaved to their Serato set-up. This provocatively named record pool offers a fairly standard slew of top 40 and dance tracks for $50 a month. Unique features include video downloads and a small salsa and bachata section. The files are high-quality (320 kbps mp3 and H.264 mp4 files) but unfortunately this quality is sparingly shared across underground/remix tracks. The interface on this website is fairly small and provides a challenging search. My12inch has some of the most features of any record pool we have reviewed, but users may feel differently about substance. This free promotional service takes no shorts in narrowing down its audience. The top 40 hip hop and mixtape crowd should be more than pleased with the selection, should you get through it, and even the odd throw-backs make an appearance. The interface is unintuitive; users have to go into “my tracks”, a list of the entire catalog that is pending your reviews, looking more like a grocery list than the hottest new tracks. Unfortunately, the search feature is also very limited, so browsing this collection is a pain. 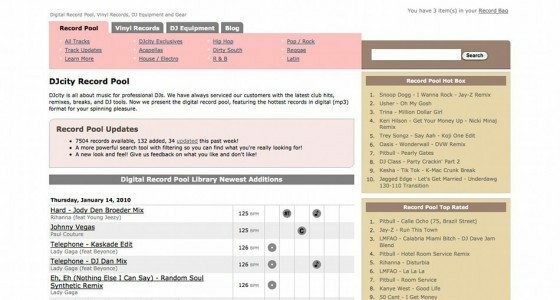 Joining a digital record pool can provide you with a lot of new pop tracks or a small pool of specialty tracks depending on what you are into. Whatever the case, choose wisely and you could end up saving quite a bit of cash in the long run. All levels of djs can benefit from this type of service: a beginning dj gets to acquire tons of tracks quickly and an expert can acquire all the newest tracks, acapellas, and instrumentals from major and indie labels alike. Bored with Serato? Well don’t be.